Kundalini Yoga Meditation - Description | W. W. Norton & Company Ltd.
For several decades, yoga has been a popular mainstream approach to health conscious living, and is used by those with medical disorders. Now, following a bevy of recent research studies, yoga has exploded onto the mental health scene, and clinicians and patients alike are embracing the use of yoga to effectively help combat psychiatric disorders. In Kundalini Yoga Meditation, Shannahoff-Khalsa—researcher, Kundalini yoga teacher for over 30 years, and worldwide authority in the field of alternative therapies for psychiatric disorders—weaves scientific insights, clinical trials, case histories, and disorder-specific techniques to explain how the ancient science of Kundalini yoga can be a useful stand-alone or supplemental treatment for psychiatric disorders. Written for all those in the mental health profession, the book begins by laying out a number of landmark scientific studies based on Kundalini yoga, all of which have led to a new understanding of mind-body dynamics, physiological states, and ways of noninvasively altering the brain and body. Included are novel yogic concepts on rhythms of the brain, personality structure, models for the mind and consciousness, and other fundamentals to enhance our understanding of health and disease processes. 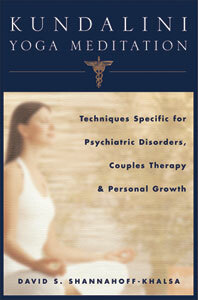 With this scientific overview in place, Shannahoff-Khalsa goes on to explore, chapter by chapter, how Kundalini yoga can be applied to the treatment of psychiatric disorders— including OCD and other anxiety disorders; major depressive disorders; bipolar disorders; addictive, impulse control, and eating disorders; insomnia and other sleep problems; chronic fatigue syndrome; ADHD and co-morbid disorders (conduct and oppositional defiant disorder); PTSD; and the abused and battered psyche. His work also illuminates the treatment of complex co-morbid disorder patients. Most importantly, each chapter includes the full set of disorder-specific meditation protocols and techniques described in complete detail—64 in total. Photographs help illustrate poses for easy simulation. The final section of the book covers the application of Kundalini yoga for individuals, couples, and groups in therapy, and includes an epilogue that discussed the future of psychiatry. Mind-body medicine is at the forefront of current mental health research and treatment, and the introduction of this ancient technology of the mind into the equation is a major breakthrough in our understanding of improved treatment for a wide variety of psychiatric disorders. Kundalini Yoga Meditation skillfully introduces this exciting new frontier, and equips psychiatrists, psychotherapists, psychologists, social workers, and other clinicians with the tools and techniques necessary to incorporate yogic meditation into their practices, and bring hope and healing to their clients.